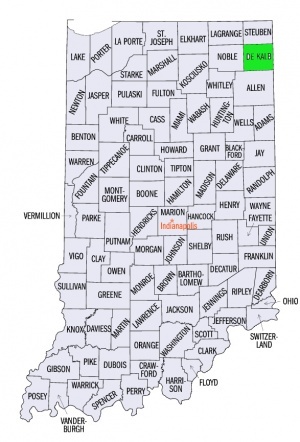 DeKalb County, Indiana, located on the Ohio line near the northeast corner of the state, was first settled in 1833 and organized in 1837, with a population of 1,000. Beginning at least as early as 1862 a small Mennonite settlement existed in the northern part of the county and the southern part of Steuben County, to the north of DeKalb. In 1861 Anthony Freed moved to Steuben County from Pennsylvania after a brief stop in Stark County, Ohio. His wife was Elizabeth Benner. In 1864, Peter Freed moved to DeKalb County with his son Henry from Virginia after stopping for several years in Columbiana County, Ohio. Other families known to have lived there were Fretz, Myers, Brand, Bechtel, Beck and Hunsberger. The congregation seems not to have built its meetinghouse, known as Pleasant Valley, until after 1869. In that year Daniel Brenneman preached the funeral sermon for Barbara Myer at the home of Jacob Brand. Ministers in the congregation at an early date were James Coyle and Eli Stofer, who usually preached in the English language. The latter was born in Columbiana County, Ohio, and moved to DeKalb County in 1864. He was ordained to the ministry in 1871. Daniel Smith, who had been a deacon in Putnam County, Ohio, was ordained a minister at Pleasant Valley. The meetinghouse and cemetery were located at Fairfield Center. Although the congregation never was large, at one time in the early 1880s eight young people were baptized into the church. The congregation, being small, seems to have been unable to withstand the encroachment of worldliness. John S. Coffman visited the congregation at numerous times, and at one time baptized a class of young people. Others would have united with the church but were unable to decide in favor of a plain church. Many of the descendants of the early Mennonites became members of the United Brethren Church. A small Brethren in Christ congregation maintained a place of worship in the western part of the county. Some of the members of the Leo Mennonite congregation in Allen County still lived near Spencerville in the southern part of DeKalb County in the 1950s. In 1908 the congregation was still in existence, for in that year it asked the Indiana-Michigan Mennonite Conference, of which it was a member, for ministerial help. As late as 1913 students from Goshen College assisted in conducting services there. Umble, John S. "DeKalb County (Indiana, USA)." Global Anabaptist Mennonite Encyclopedia Online. 1956. Web. 25 Apr 2019. http://gameo.org/index.php?title=DeKalb_County_(Indiana,_USA)&oldid=120117. Umble, John S. (1956). DeKalb County (Indiana, USA). Global Anabaptist Mennonite Encyclopedia Online. Retrieved 25 April 2019, from http://gameo.org/index.php?title=DeKalb_County_(Indiana,_USA)&oldid=120117. Adapted by permission of Herald Press, Harrisonburg, Virginia, from Mennonite Encyclopedia, Vol. 2, pp. 26-27. All rights reserved.